Our lovely country cemetery is an integral part of the JCA. In 1979, through the leadership efforts of Normand Berlin, one of the founders of the community, and with support from the first Cemetery Committee, the JCA purchased appropriate land and established a cemetery following the Jewish tradition of providing burial space for all members. 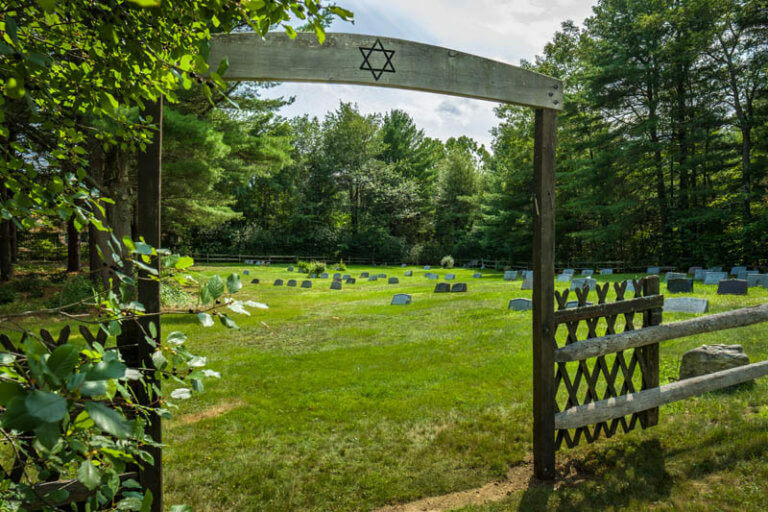 Located in Shutesbury, our cemetery has two sections: a cleared area where cement grave liners are required for burial (see Cemetery Guidelines), and a recently opened forested green burial section which adheres to many green burial standards (see Green Burial Guidelines). Plots are available for purchase in both sections to members and non-members who agree to adhere to the guidelines, and financial information is available in both documents. We will gladly provide any further information you need, and welcome your inquiries. From the JCA, turn left out of the parking lot and follow Main Street toward Pelham for 1.7 miles. Turn left onto North Valley Road. The Pelham Fire Department is on the right. Go for 1.3 miles, then take your first left onto Buffam Road where there will be a sign for Shutesbury. Go for approximately 5 miles until the end of the road. At the T, turn left onto Leverett Road, and the third driveway on the left is the JCA Cemetery. The clearing and fence can be seen as well as the handcrafted sign with a Star of David.